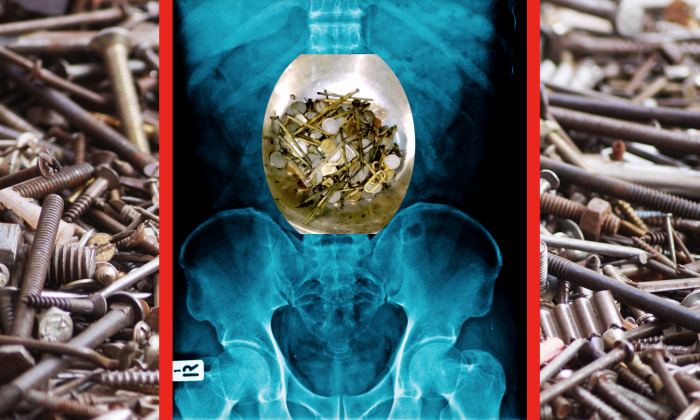 A man was rushed to the hospital with suspected food poisoning, but instead surgeons removed 263 coins and 100 nails from his stomach, reports the Independent. Maksud Khan, 35, had complained of abdominal pains and was taken to the Sanjay Ganhdi Hospital in Madhya Pradesh, India, wrote the Independent. Doctors carried out an endoscopy in order to find out what was causing the man’s intense intestinal malaise. They were shocked to discover hundreds of coins, over 3 pounds of nails, dozens of shaving blades, shards of glass, stones, and a 6-inch length of chain. Surgeons immediately went to work on removing what amounted to about 15 pounds of foreign objects from the man’s stomach. According to the Sun, the head of the surgical team that performed the operation, Dr. Priyank Sharma, said, “The patient was complaining of stomach pain, so we thought of getting an endoscopy done. “We were shocked to discover that coins, nails, and nut-bolts in his stomach. It was the first time in our careers we have come across such a case,” Sharma said. The doctor believes Khan suffers from mental health problems. “This man looks to be mentally unstable as no sane person would do something like this,” said Sharma. The Daily Mail reported that Khan worked as a three-wheeled rickshaw driver and developed the habit of swallowing coins given to him by customers. “Whenever he felt the urge to ingest a coin, he ingested it with water,” said a family member, according to Daily Mail. The man had reportedly been complaining of stomach pains for three months, though apparently the objects did not cause Khan pain or problems when he first began ingesting them. “The operation was done in the nick of the time as some of the nails lodged had pierced his stomach, caused bleeding, and resulting in loss of hemoglobin,” the Daily Mail cites another doctor involved in the surgery. Khan’s family suppose his bizarre eating habit could be linked to a recent bout of depression, according to Daily Mail. The man is reportedly on the road to making a full recovery. But Khan’s case is far from isolated. A number of similar cases have been reported worldwide, including an instance of a farmer from southern Punjab, India, who had 40 coins, 150 nails and a handful of nuts, bolts, and batteries removed from his stomach, reported Fox. Watch this video titled “15 Craziest Things Swallowed by People” for a lighter take on the unusual things people have ingested. Please join all those who support independent journalism and share this article far and wide!